Had friends in from out of town, went to visit other friends too, one ladies' husband was a super nice guy always making sure everyone at the party had whatever they wanted….died last December 21, solstice day. Big surprise to us and super quick, he had pancreas cancer (same thing took Steve Jobs down) which is often not diagnosed until it is too late, and it readily spreads to other organs, so sometimes its called the silent cancer. It is predicted to be the 2nd most deadly cancer by 2030. There is no blood test catch it early, some blood tests might be a “clue”, but they will not do this as part of standard blood work. Using mathematical models to study the timing of pancreatic cancer progression, the scientists conservatively estimated an average of 11.7 years before the first cancer cell develops within a high-grade pancreatic lesion, then an average of 6.8 years as the cancer grows and at least one cell has the potential to spread . Green tea (you can buy it in a pill) is shown to reduce pancreatic cancer risk. But there are “signs” but these signs come too late almost always. I also have friends that have lost loved ones in Hawaii, from this. 50% of all victims have these 2 signs, however, once you have these symptoms, it may be later stage and too late. Abdominal Pain (sheesh, wasn’t this item 2 also? Poor oral hygiene. Amazingly heart disease is closely linked to poor oral hygiene, flossing AND use of mouthwash daily, pretty much eliminates this risk, so is a no-brainer. 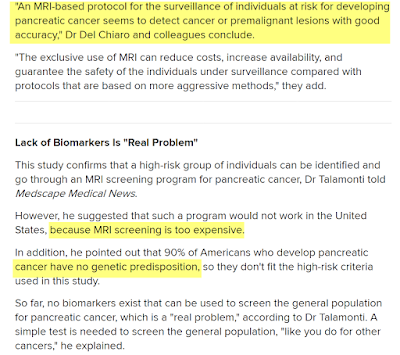 There is basically no commonly available way for early detection, and the new strategies of the “medical system” are to not screen for pancreas cancer AT ALL. So like all other modern medicine, your health is controlled by for profit corporations, who insist on rationing care and it’s getting worse. Knowing what to say and how to say it may get you better treatment. Doctors have to justify every test to insurance companies, so they need a reason to request a test. Family history / genetics is one of the best ways. There is a blood test that looks for “CA 19-9” but it doesn’t always get produced even if you have pancreatic cancer, and sometimes there is a false positive, and sometimes, if detected, it’s already too late. So they use this as an excuse to not test at all, see how that works? Your best bet for getting tested is to explain any family history of pancreas cancer, but history of other types of cancers of course it needs to be direct blood relatives. CT scans can be used, but these involve thousands of X-ray in just seconds, so the radiation dose is unacceptable high. Like 20 years of radiation in a few seconds. CT should be outlawed, as MRI is superior is all aspects, except some specific bone imaging. But they still have these CT machines and the people who know how to use them, so they still use them. A special kind of MRI called an MRCP can give high-quality pictures of the pancreas, the pancreas duct, and the bile ducts. 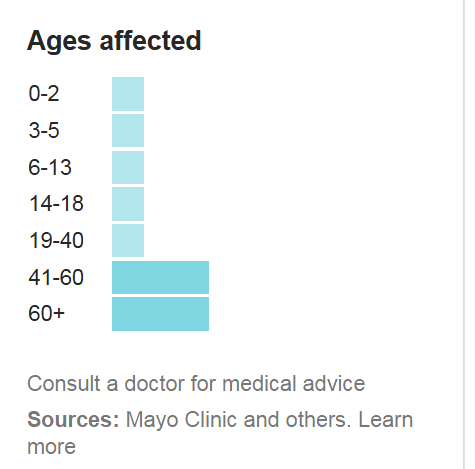 However, some patients who are claustrophobic may decide against having an MRI performed. Some doctors will prefer an Endoscopic Ultrasound over even the MRCP/MRI because they can also get a biopsy at the same time, a biopsy is a tissue sample they can get with a very fine needle. The “Endoscopic” means they stick a tube down your throat with the ultrasound and a tissue gathering needle. 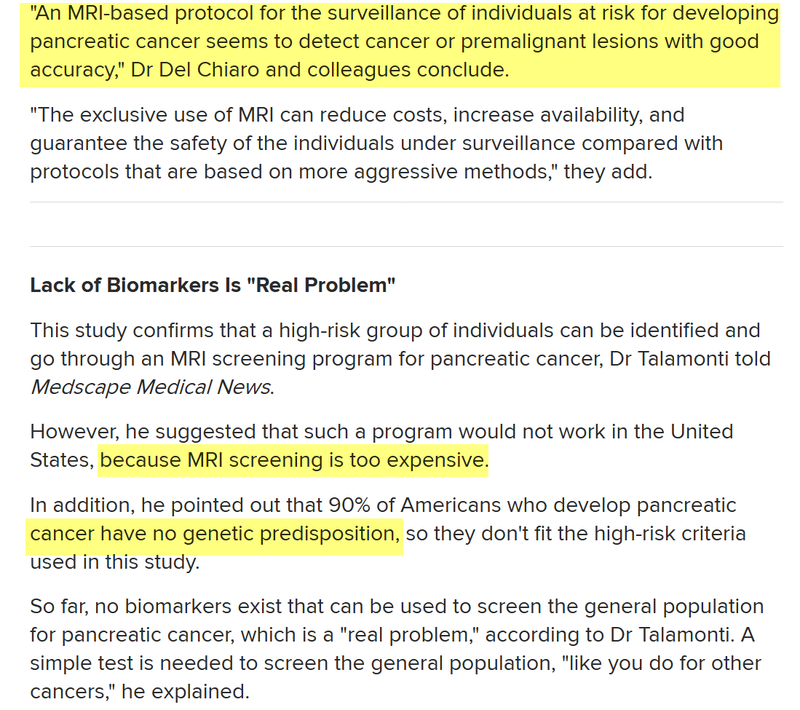 They also feel that they can get a better view of the pancreas than with the MCRP/MRI, but that seems a little sketchy to me. I think they like the “biopsy” approach because then they have “proof”. But the problem with taking byopsies is that if you are poking into cancer stuff, you can also spread the cancer right then and there. Of the 40 study participants, 38 (95.0%) had a family member with pancreatic cancer, four (10.0%) had a p16 gene mutation, three (5.0%) had a BRCA2 mutation, and one (2.5%) had a BRCA1 mutation. The BRCA mutations are among the most common genetic mutations associated with familial pancreatic cancer. They also prove that eating animals, makes you less likely to be depressed. Another duh!